D-backs scouts and cross-checkers are here with members of the D-backs’ front office, ready to draft the next wave of D-backs prospects. Once the D-backs make their selection we’ll get D-backs Scouting Director Tom Allison’s view on the pick, and get an interview with him as soon as he’s free for a few minutes. Television coverage has started. Tune into MLB Network on your local cable outlet for live coverage. Representing the D-backs at the draft are D-backs Special Assistants to the President and CEO Roland Hemond and Luis Gonzalez. The Washington Nationals are on the clock…. Unless something completely insane happens in the next five minutes, it will be junior college catcher Bryce Harper. The real excitement begins with Pittsburgh at No. 2. Fascinating part of the draft, as they’re discussing on TV – the Nationals selected outfielder Bryce Harper. Interesting. He’s been a catcher to this point in his career, but it seems like that may be no more. The Pirates selected Texas high school pitcher Jameson Tallion, so we’re getting closer. The Orioles are on the clock, with four picks to go until showtime. We’re three picks away as the Orioles select high school shortstop Manny Machado. Got this text from Gonzalez: “It’s a big day for a lot of kids with big league dreams.” Two more picks to go, as the Kansas City Royals select shortstop Christian Colon. The Cleveland Indians selected Ole Miss lefty Drew Pomeranz. The D-backs are on the clock! With the No. 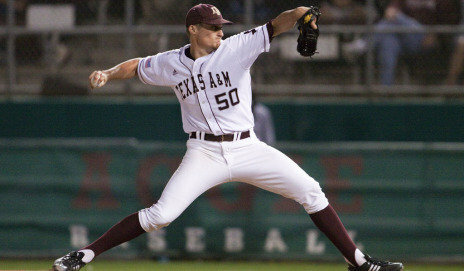 6 pick in the 2010 MLB Draft, the D-backs select Texas A&M right-handed pitcher Barrett Loux. Loux’s team will play in an elimination game tonight for the chance to play in the NCAA Super Regional. Loux, a 6-5, 225-pound right-handed pitcher, was named a Louisville Slugger NCAA Division I Third-Team All-American, First-Team All-Big 12 and is a semifinalist for the USA Baseball Golden Spikes Award for his season at Texas A&M University. The junior is 11-2 with a complete game and a 2.60 ERA (30 earned) over 104.0 innings pitched in 16 starts this season. He has limited opponents to a .197 average with 33 walks and 136 strikeouts. Loux also led the Big 12 with 126 strikeouts.